CINCINNATI -- Andrew Wiedeman gives fellow FC Cincinnati forward Jimmy McLaughlin a hard time about all the Post-it Notes plastered around his bathroom mirror. Quotes like Winston Churchill’s famous line, “If you’re going through hell, keep going,” fill the colorful sticky notes meant to provide inspiration to the 24-year-old from just outside Philadelphia. But even Wiedeman, one of McLaughlin’s best buds on the team, can take a step back and acknowledge his jokes might be misplaced. 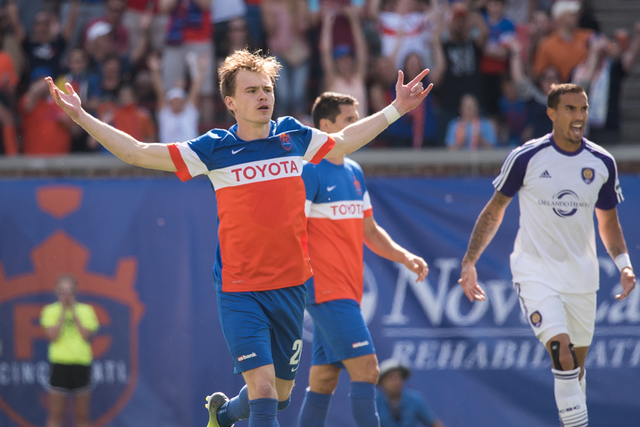 Perhaps those quotes have a little something to do with why McLaughlin is playing some of the best soccer of his career and why he’s sure to make an impact as FC Cincinnati hosts the Charlotte Independence on Saturday. Fans have come to know McLaughlin as a fun-loving and extremely positive guy. He’s the player for whom GIFs have been created with his amusing goal celebration dances -- a couple that Wiedeman says ranked among the best on the team last year. McLaughlin apparently has an intellectual side, too. He enjoys reading and often is found highlighting parts that stand out -- though Wiedeman is certain he’s just coloring. But, behind the scenes, a more serious McLaughlin plays a crucial role for FC Cincinnati. In 11 games and 10 starts, McLaughlin has just one goal and one assist -- a beautiful slicing cross to Danni Kong’s head at the far post in a 2-1 win over Bethlehem on May 20, However, he leads the team in two underrated categories with 16 created chances and 27.8 percent accuracy on a team-high 36 crosses. A humble McLaughlin doesn’t mind the attention falling on the center forwards. He calls it “a special thing,” to see one of his crosses or passes result in a goal for a teammate. McLaughlin also had a hand in Konig’s game-winning goal against Toronto FC II on May 27, drawing two defenders to free up Tyler Polak for a cross that Konig headed in from point-blank range. Koch, who wasn’t with Cincinnati last year, has seen great improvement from McLaughlin since his first season with the team. Koch’s base knowledge comes from hours of studying film from every match last year, when McLaughlin tallied four goals and two assists as a regular starter. Everything from McLaughlin’s service to his one-on-one duels to even his defense has reached another level this season. “I think he had a good year last year, but he's having a great year this year and I still think he hasn't even reached his peak yet,” Koch said. “He's a younger player obviously in this business, and he's definitely got areas of his game to work on, but the beauty of Jimmy is he's got the willingness to address his deficiencies." McLaughlin said he is playing with a lot more confidence this season, as he also has noticed a difference in his play. He attributes his improvement to an array of factors. “It's a great platform here for players to get better with great coaching, great environment, great setup, great facilities,” McLaughlin said. “I think you put all that together and it makes for a growth-oriented environment where guys can improve and move onto the next level." Part of the improvement could be just more comfort in the new environment. 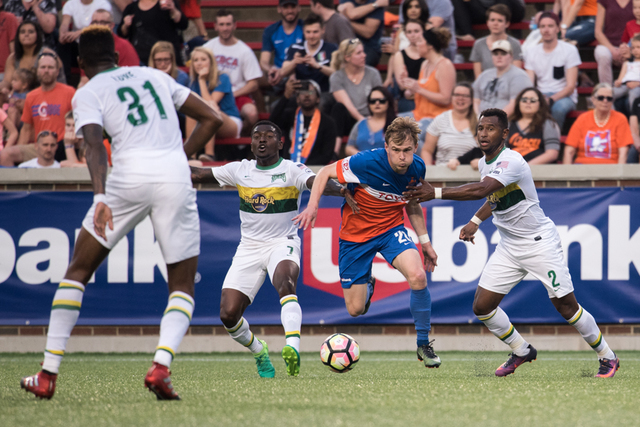 Before coming to Cincinnati ahead of the club’s inaugural season last year, McLaughlin had only known one professional soccer organization. He came up through Major League Soccer’s Philadelphia Union youth academy -- captaining the Union youth team in its first tournament. He eventually signed as the Union’s second homegrown player in December 2011, following his Patriot League Rookie of the Year freshman campaign at Colgate University. McLaughlin made his professional debut in a 3-0 win over USL side Rochester Rhinos in a third-round U.S. Open Cup game May 29, 2012, coming in as a sub for Freddy Adu, He made his MLS debut that October. However, he was frequently loaned to USL affiliate Harrisburg City Islanders throughout his four seasons with Philadelphia -- sharing the team’s golden boot in 2014 with six goals -- and eventually was ready for a change of scenery. “I grew up outside Philadelphia so it's a special place for me,” McLaughlin said of his time with the Union. “My friends and family are all from the area, and I've known the coaches of the Union since I was a kid, really, since I was a youth player. It was difficult leaving, but for me and where I was in my career, I needed to do something different and take a step out of my comfort zone and this was a great opportunity." Wiedeman wouldn’t be surprised to see McLaughlin back in MLS, though, whether that is with FC Cincinnati should it get promoted in the future or through another opportunity.